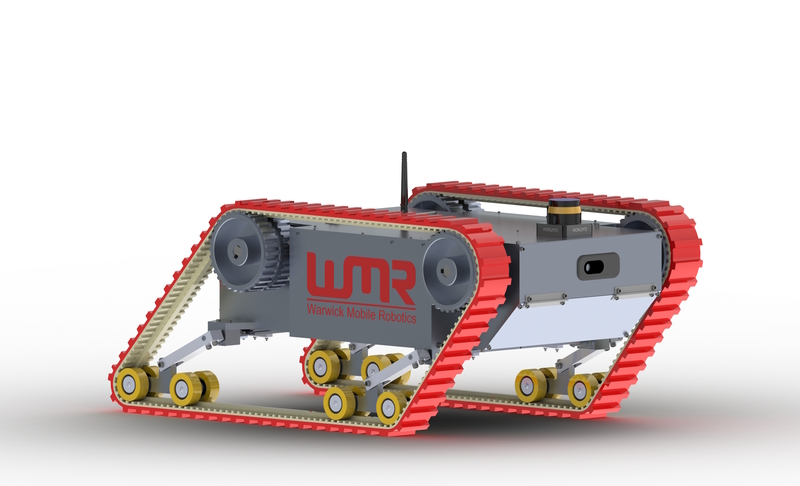 After lots of design work, simulation and testing manufacture of the new WMR Search and Rescue robot is underway. Material has been arriving in the workshop and the first new parts are being manufactured. The new design builds on where 2014/15 Orion left off, incorporating what was learnt last year with a larger modular design, adjustable independent suspension and more powerful motors and electronics. The modular nature of the new robot will provide a platform that future teams can build on. It will be easy to swap in new modules to change the robot's capabilites for the task at hand. As manufacturing progresses we will update with progress picuteres, in the meantime the image below is a rendering of what the new robot will look like. WMR will be at the "Festival of the Imagination" on Saturday 17th October in Warwick Arts Centre at the University of Warwick. We will have our robots in the Helen Martin Studio, with Warwick's Computer Science department, all day and a talk on "Robots for Real" at 11.30 am. This is part of the university's 50th anniversary celebrations. The events are showcasing the work we do at Warwick through a diverse programme of events all focused around the central theme 'Imagining the Future'. So at WMR we not only like to imagine the future but go someway to bring that future to reality! Have a play with our mini rescue robots, Custard and Cream (because they have Raspberry Pi's), and see if they can rescue Robin? WMR are mentioned in the online trade magazine Eureka in association with Maxon Motor UK Ltd who have not only been great sponsors for the project over many years but also very helpful with their knowledge and technical support. New team of 4th year engineering students are due to start at the beginning of October. It will be up to them to decide where the project will head! However, currently we are preparing for Warwick's open day where 100's of prospective engineers will be touring the workshop and attending talks. Open day is on Saturday 20th September.